Coe Press Equipment, Sterling Heights, MI, introduces the SyncMaster feed-line control package for integrated coil-feed lines, allowing operators to control servo-feed, straightener and coil-reel setups and functions from a single location. With features typically only included with fully integrated PLC-based systems, SyncMaster setups include a coil reel, power straightener with AC drive, and a PLC that controls the straightener and reel and communicates with the servo feed. The servo feed has a touchscreen HMI that controls the feed and communicates via Ethernet with the straightener and reel. • System E-stop control from the feeder and straightener operating stations. 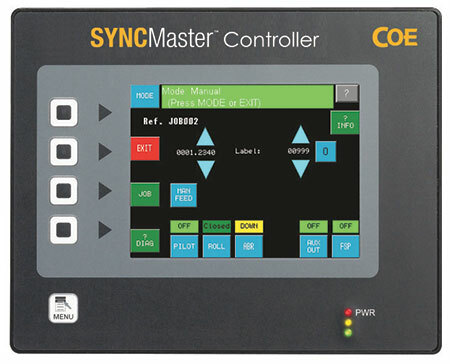 The SyncMaster controller features a user-friendly 5.7-in. color touchscreen with a selectable scale for feed length, passline height and edge guides. It provides a 400-job set memory, automatic speed compensation, and fault display and history.